At the end of August Yelp released what is the first iPhone Augmented Reality app. 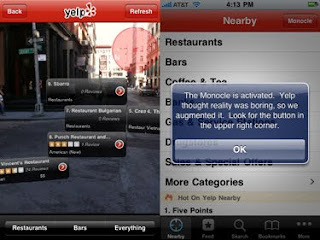 The latest version of Yelp allows users to access a features called Monocle. The app gives you a real time overlay of Yelp's business listings within your field of view, utilising the iPhone's digital compass and GPS to provide geo-location. The most interesting thing about the app is that it's actually an Easter Egg activated by shaking the handset three times. The feature is considered an Easter Egg as Apple don’t actually provide an open API to allow developers to access a live video feed from the iPhone’s camera. This essentially makes it impossible to develop Augmented Reality apps for the iPhone without hacking their software development kit. The Yelp app is available to download here. Also check out Jenn's personal blog here.